On my trip to Thailand, it was the various ancient Buddhist temples that had me in awe. They had me so curious and I loved the architecture of these temples, as well as the precision with which the Buddha sculptures were made. I was also particularly interested in the Hindu influence and found it fascinating that some temples even had scenes from the Ramayana, which is Hindu, as well as relatable Hindu names. This list is not comprehensive but the ones we visited in Bangkok and the historical town of Ayutthaya, which is an hour’s drive from Bangkok and a definite trip to do if in Thailand. Ayutthaya was once an ancient Thailand capital and the trading capital of Asia, founded in 1350. In its heyday, Ayuthaya was filled with enormous monasteries, exquisite temples and gold filled palaces in a city considered one of the finest in the world. In 1767 the Burmese army invaded and destroyed the city of Ayutthaya. All that remains are the ruins of the old city which are preserved in its historical park and give a glimpse into the history of magnificent city that once stood in its ruins. It is now an UNESCO World Heritage Site. When I do return to Thailand and visit some more temples I will be sure to expand on my list. Starting with the City of Angels, Bangkok, Wat Arun, named after the Indian god of dawn (Aruna) is a must visit and we accessed it by boat, as it is located western side of the Chao Phraya River. It also features on the 10 Baht coins and is gorgeous. The details on the temple buildings at Wat Arun were just mesmerizing. There was lots of colorful porcelain patterns and intricate design work, which sparkled in the bright sunshine. I would have loved to have had a chance to view it in the evening too as I am sure it would look amazing as I’ve heard the night view is epic. Wat Phanan Choeng is located in Ayuthhaya, which is just over an hour’s drive from Bangkok. It houses an impressive 19 metre tall Buddha statue called Phra Chao Phanan Choeng. It was built by a king as a cremation site in honour of his fiancée Princess Soi Dok Mak, who killed herself there after waiting there for him for too long. The 19 metre Buddha statue was just phenomenal. There were lots of people coming in to pay their respect and seek blessings here and praying beneath him. Legend has it that when the Burmese destructed Ayutthaya in 1767 the Buddha shed tears. This temple is one of the landmarks of Ayutthaya, with the famous Buddha’s head entwined within the tree roots of a Banyan tree. 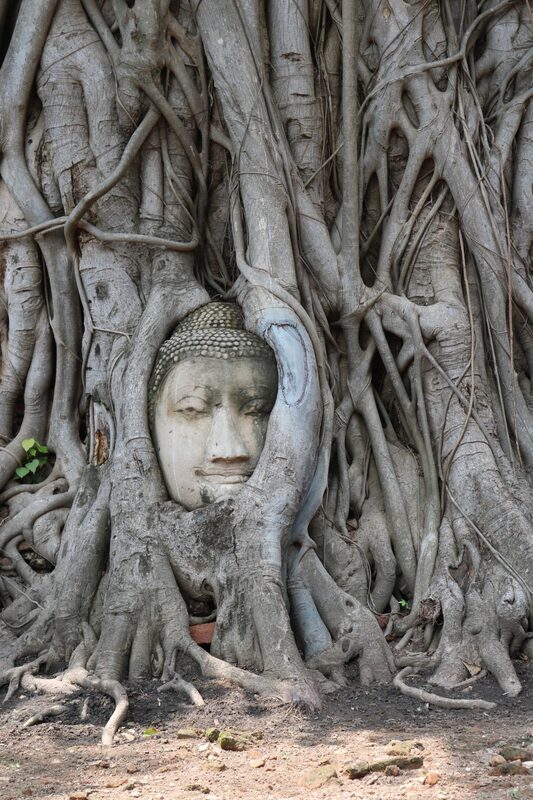 It is thought that when the Burmese attacked Ayutthaya, they destructed the Buddhist temples and so the head of the Buddha may have been discarded on the ground and over time the tree roots grew around it. It was amazing to see and definitely one of the most unique Buddhas I have ever had the pleasure to ever see in my life and so if you are planning a trip to Ayutthaya it is a must! It was also really interesting to see the grounds and the various ruins around it of the other statues. Also located in Ayutthaya, I loved this temple with its towering stupa, golden statues and rows of Buddhas in saffron robes. The giant reclining Buddha draped in cloth is spectacular and the highlight for me was meeting an equally keen photographer in a monk from the onsite monastery, who was milling around among the tourists. The enormous stupa is visible from all over Ayutthaya and was constructed after King Naresuan defeated a Burmese crown prince during a battle on elephants at the end of the 16th Century. Wat Phra Si Sanphet is the largest temple in Ayutthaya and is situated in the former royal palace. It has 3 distinctive stupas, which are usually the postcard image of Ayutthaya and are definitely beautiful ruins to see while in Ayutthaya. It was massive and really gives an insight into how important the city was in historical times. Ayutthaya is a definite must and given its short distance from Bangkok, definitely worth visiting for the awe-inspiring temples, as well as to gain an understanding of the history. When visiting Buddhist Temples, always ensure that your shoulders and knees are covered as a mark of respect. Have you visited Bangkok and/or Ayutthaya? What were your highlights? I would love to know in the comments below. Your Thailand trip looked incredible!